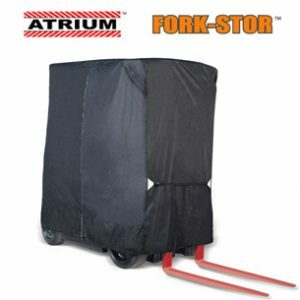 The Original Atrium "Full Forklift Cab Enclosure" by Eevelle - This is a perfect item for those foul weather days in or out of the warehouse. 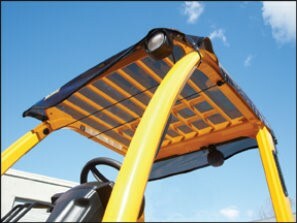 The Atrium attaches in seconds and fits to any forklift. Zippered doors can be shut or unzipped and folded back while working. Perfect for rainy days so you have the ability to keep working while staying warm and dry! Great for the yard and warehouse. -attaches in seconds to any forklifts. 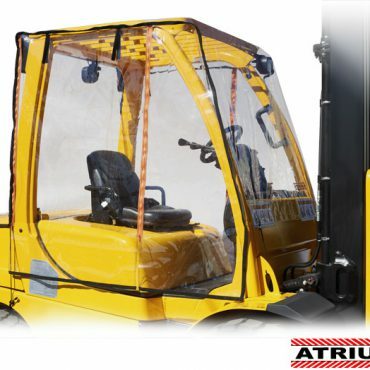 This cover is made of a clear material so you can safely operate your forklift while your operator is protected from weather, wind, dust, rain etc. Zippered doors can be shut or unzipped and folded back into place while working. Perfect for those rainy days so you can still work warm and dry.